Saul (or Sha'ul) (Hebrew: שָׁאוּל, meaning "given" or "lent") was the first king of the ancient Kingdom of Israel who reigned from about 1020–1000 B.C.E. Described in the Bible as a man of uncommon promise and valor, Saul united the tribes of Israel against the power of the Philistines, but lost the support of a key ally—Samuel, the powerful prophet and judge who had initially identified and anointed him as God's chosen leader. Despite subsequent military successes and a promising heir in his son Jonathan, Saul became a tragic figure. He was plagued by what the Bible describes as "an evil spirit from the Lord," and what psychologists would recognize as classic symptoms of manic-depression. Much of the later part of Saul's reign was consumed by fighting against Israel's enemies on one hand and seeking to destroy his divinely-appointed successor, David, on the other. He died in battle soon after the death of his son Jonathan, leaving his lesser sons as heirs. Within a few decades, his rival, David, had brought Saul's former kingdom under his sway and taken his only surviving heir into captivity. It should be noted that the story of Saul is largely written and edited by biblical writers who favored the southern, or Davidic, Kingdom of Judah. Our picture of Saul is therefore not an objective one. If his own supporters had written histories of his reign which survived intact, we would no doubt have a very different portrait of him. According to the Books of Samuel, Saul was the son of a man named Kish, and a member of the tribe of Benjamin. We are told little about Saul's youth other than that he was "an impressive young man without equal among the Israelites—a head taller than any of the others" (1 Sam. 9:2). However, biblical scholars suggest that some of the details in the story of Saul's childhood may actually be found in the infancy narrative now attributed to Samuel. Evidence for this is found in the meaning of Saul's name and in that the story of Samuel's infancy seems, in some respects, to describe that of a future king rather than a prophet. The Lord has granted me what I asked [sha'al] of him. So now I give [sha'al] him to the Lord. For his whole life he will be given over [sha'al] to the Lord" (1 Sam: 27-28). Moreover, the Song of Hannah, a psalm of praise expressing Hannah's response to the birth of her son, can more easily be interpreted as referring to her son as a monarch than a prophet or judge: "He [God] will give strength to his king and exalt the horn of his anointed" (1 Sam. 2:10). He was extraordinarily upright as well as perfectly just. Nor was there any one more pious than he; for when he ascended the throne he was as pure as a child, and had never committed sin. He was marvelously handsome; and the maidens who told him concerning Samuel talked so long with him that they might observe his beauty the more. The Bible gives a threefold account of how Saul came to be appointed king. First, he is privately chosen by the Prophet Samuel and anointed as king. Second, he is re-anointed in public after God confirmed the choice by lottery. Finally, he is confirmed by popular acclaim after uniting the tribes of Israel in victorious battle. Modern biblical scholars, on the other hand, tend to view the accounts as distinct, representing at least two and possibly three separate traditions which were later woven into a single account. Saul publicly acknowledged as king. (1 Samuel 9:1-10:16): Saul travels with a servant to look for his father's she-asses, who have strayed. Leaving his home at Gibeah, they eventually wander to the district of Zuph, at which point Saul suggests abandoning their search. Saul's servant however, suggests that they should consult the local "seer" first. 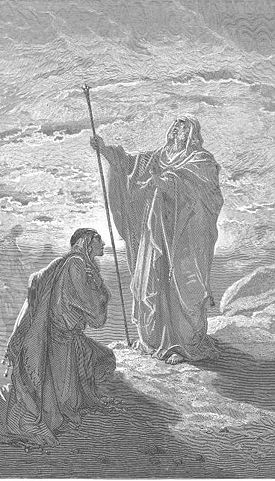 The seer (later identified as Samuel) offers hospitality to Saul when he nears the high place at Ramah, and later anoints him in private. (1 Samuel 10:17-24 and 12:1-5): Seeing that Samuel's sons were corrupt, the Israelites demand a king to rule and protect them. Samuel therefore assembles the people at Mizpah and, despite having strong reservations, obeys God's instruction to appoint a king. In this version, a lottery system is used to determine the choice. First the tribe of Benjamin is chosen, and then Saul. The seemingly unsuspecting Saul seeks to avoid his fate by hiding in the baggage. He is soon discovered, anointed, and publicly proclaimed. The text notes, however, that certain "troublemakers" grumble against the choice. In any case, the tribe of Benjamin was an unlikely choice for a king. Saul's own declaration "Am not I a Benjamite, of the smallest of the tribes of Israel?" betrays not only his own lack of confidence but also the fact that Benjamin was, by this time, a weak and despised part of the Israelite confederacy (1 Sam. 9:21). Indeed, the final chapter of the Book of Judges speaks of the Israelites swearing that "Not one of us will give his daughter in marriage to a Benjamite" (Judges 21:1). Although this oath was later rescinded, there can be little doubt that the choice of a Benjamite as king would be problematic to many among the other tribes. On the foundation of his fame in winning a victory over the Ammonites, Saul amassed an army to throw off the Philistine yoke. Just before this battle, however, he had a serious falling out with Samuel. Samuel had instructed Saul to wait seven days for him at Gilgal. Saul did so, but as the hour of Samuel’s coming approached, Saul’s men begin to desert. When the appointed time came and went without Samuel appeance, Saul prepared for battle by offering sacrifice to God. 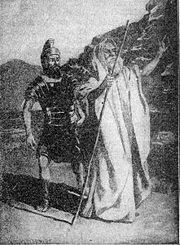 Samuel soon arrived on the scene and condemned Saul, apparently for usurping the priestly role. Samuel withdrew his support for Saul and declared that God has chosen another to replace him. Deprived of Samuel's blessing, Saul's army became small, numbering only around six hundred men. The text portrayed the Philistine army as vastly outnumbering the Israelites and also as having superior weaponry due to their mastery of the art of metalworking, while the Israelites use mostly flint and wood weapons. Map showing several locations related to Saul's life. Jonathan and a small group of courageous Israelites cleverly snuck into a Philistine outpost without Saul's knowledge to attack them from within, causing panic. However, trouble was brewing for the Israelites spiritually. Saul has vowed that his men would not eat until the battle was over, and Jonathan—who has not heard the vow—consumed wild honey. Nevertheless, the battle went well. When the Israelites noticed the chaos in the Philistine camp, Saul joined in the attack and the Philistines were driven out. However, some of his soldiers sinned by eating plundered meat that had not been properly slaughtered. Saul asked his priest, Ahijah, to use divination to ask God whether he should pursue the Philistines and slaughter them, but God gave no answer. Convinced that God's silence was due to someone's sin, Saul conducted a lottery and discovered Jonathan's sin of eating forbidden honey. Saul determined to slay Jonathan for his offense, but the soldiers came to Jonathan's defense. Saul relented, and he also cut off his pursuit of the Philistines. After Saul had assumed rule over Israel, he fought against their enemies on every side: Moab, the Ammonites, Edom, the kings of Zobah, and the Philistines. Wherever he turned, he inflicted punishment on them. He was assisted in these efforts by his war captain, Abner, as well as by David and Jonathan. The record says little about his administrative efforts or the details of the Israelite tribal alliances. Later it was learned that the tribe of Judah supported David in opposition to Saul and his progeny, whose support seemed to come more from the northern tribes, but few details are given. Samuel appeared again and gave Saul another chance. He was told to make holy war against the people known as the Amalekites. To conduct a war acceptable to God, Saul was instructed to slay every last one of these people, including women and children, as well as livestock. However, he was also told that his troops must refrain from taking plunder of any kind. Samuel rejects Saul as king. I did obey the Lord. I went on the mission the Lord assigned me. I completely destroyed the Amalekites and brought back Agag their king. The soldiers took sheep and cattle from the plunder, the best of what was devoted to God, in order to sacrifice them to the Lord your God at Gilgal. Samuel rejected this explanation. Saul then admitted his sin and begged for forgiveness, pleading for Samuel to return with him "so that I might worship God." Samuel, however, declared that God had rejected Saul as king. He turned away, and Saul desperately grabbed his garment, which ripped. Samuel interpreted this as a prophetic act, confirming that God had torn the kingdom from Saul. 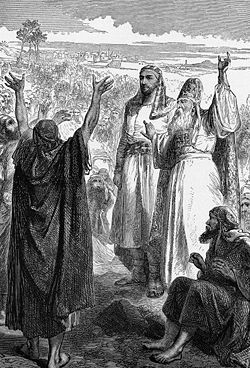 Samuel made one concession and allowed Saul to worship God with him. He then commanded that Agag be brought forth. He promptly "hew[ed] Agag in pieces" and left the scene, never to see Saul again in this life (1 Sam. 15:35). David and Saul (1885) by J. Kronberg. As David arrived on the scene, Saul was cast firmly in the role of antagonist. He became the dark central figure in a tragedy of Shakespearian proportions. The text tells us that God's spirit had left Saul, and an "evil spirit from God" had obsessed him (1 Sam. 16:14). Saul requested soothing music, and a servant recommended David, the son of Jesse, who was renowned as a skillful harpist and warrior. David was appointed as Saul's armor bearer, playing the harp as needed to calm Saul's moods. It is mentioned later that Samuel had previously gone to Bethlehem and secretly anointed the young David to be Israel's king. The story of David and Goliath intervenes at this point, clearly from a different source than the story above. In this story, the Philistines returned with an army to attack Israel, and Jesse sent David not as harpist to the king, but simply to carry food to his older brothers who were serving in the army (1 Samuel 17:1-18:5). David learned that the giant Goliath had challenged Israel to send its champion to fight him. David volunteered for the task. Saul, who in this story had not met David previously, appointed the lad as his champion. David defeated Goliath and became the king's favorite. Jonathan, a kindred spirit to David, made a pact with him, giving him his own clothing and weapons. Saul dispatched David on various military errands, and he won renown. The story took an ominous turn, however, as the Israelite women took up the chant: "Saul has slain his thousands and David his tens of thousands." Saul then began to see David as a possible threat to the throne. The text gives us an insight into Saul's spiritual character at this point, as it describes him as "prophesying in his house" (1 Sam 18:10). Earlier it described him as engaging in ecstatic prophesy with the bands of roving prophet-musicians associated with Samuel (1 Sam. 10:5). One might picture David and Saul engaging in this type of intense spiritual-musical activity together, rather than David softly strumming while a depressed Saul lies next to him. This other-worldly tendency in Saul also apparently made him vulnerable to spiritual obsession. Thus, while Saul was prophesying, the evil spirit from God "came forcefully upon him" and inspired him to attempt to murder David. David twice eluded the king's attacks, and Saul then sent David away, fearing the lord's presence with him. Ever caught in what modern readers would recognize as the throes of bi-polarism, Saul then decided to give David the hand of his daughter. First he offered David his eldest, Merab, and then Michal, the younger, who had fallen in love with David. David stated that he was too poor to marry a king's daughter, but Saul insisted, telling David that the bride-price would only be one hundred foreskins from the Philistines. The narrator informs us that Saul actually hoped that the Philistines would prevail over David, but the champion returned with twice the required number. Having tendered this gory gift, David was married to Michal. Until this point, the text states that David continued to act as one of Saul's war captains, proving especially effective in several campaigns against the Philistines. The focus of the narrative, however, is to provide the details of several further plots by Saul against David. Jonathan dissuaded Saul from a plan to kill David and informed David of the plot. 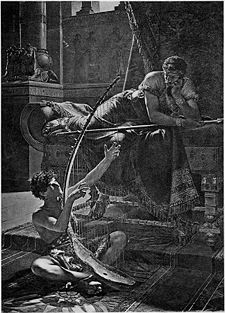 David (quite foolishly if the order of the story is correct) once again played the harp for Saul, and Saul again tried to murder him. Saul then tried to have David killed during the night, but Michal helped him escape and tricked his pursuers by disguising a household idol to look like David in bed. David fled to Samuel. The Spirit of God came even upon him, and he walked along prophesying until he came to Naioth. He stripped off his robes and also prophesied in Samuel's presence. He lay that way all that day and night (1 Sam. 19:23-24). Leaving Samuel's protection, David went to Jonathan, who agreed to act as David's intelligence agent in Saul's house. Saul saw through this and castigated Jonathan for disloyalty. It became clear that Saul wanted David dead. Jonathan told David of Saul's intent, and David again fled. Saul later caused Michal to marry another man in place of David. Saul now treated David as both a rival and a fugitive traitor. An Edomite named Doeg told Saul that David had been hiding in a place named Nob, and that the priest there, Ahimelech, had helped David by giving material aid and consulting God for him. Saul summoned Ahimelech and castigated him for his assistance to David, then ordered henchmen to kill Ahimelech and the other priests of Nob. None of Saul's henchmen were willing to do this, so Doeg offered to do it instead, and he killed 85 priests. Doeg also slaughtered every man, woman, and child still in Nob except Ahimilech's son Abiathar, who made good his escape and informed David of events. David amassed about four hundred disaffected men together as a group of outlaws. With these men, David attacked the Philistines at Keilah and evicted them from the city. Hearing the news, Saul led his army there, intending to besiege the city. David learned of Saul's plan and, through divination, discovered that the citizens of Keilah would betray him to Saul. He fled to Ziph, where Saul again pursued him. The Bible retains two versions of the humorous story of Saul and David at Ziph, both involving David as a clever trickster who is in a position to slay Saul, but refrains due to his belief that to slay "the Lord's anointed" would be a sin. Tiring of playing cat-and-mouse with Saul, David fled to the Philistine city of Gath, the birthplace of Goliath, where he offered himself as a mercenary general to King Achish, Israel's adversary. Seeing that his rival had gone over to the enemy and seemed no longer to seek the throne of Israel, Saul broke off his pursuit. The medium of Endor contacts the spirit of Samuel, who predicts Saul's doom. The Philistines now prepared to attack Israel, and Saul led out his army to face them at Gilboa. Seeking in vain for God's advice through prophets, dreams, and divination, Saul searched for a medium through whom he could consult with the departed soul of Samuel. In so doing, Saul broke his own law against such activity. At the village of Endor, he found a woman who agreed to conjure the spirit of the famous judge. 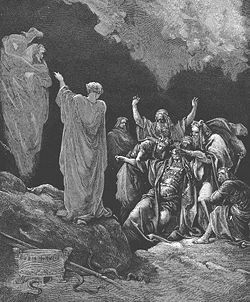 Samuel's ghost only confirmed Saul's doom—that he would lose the battle, that Jonathan would be killed, and that Saul would soon join Samuel in Sheol. Broken in spirit, Saul returned to the face the enemy, and the Israelites were soundly defeated. Three of Saul's sons—Jonathan, Abinadab, and Malki-Shua—were slain. Saul himself suffered a critical arrow wound. To escape the ignominy of capture, Saul asked his armor bearer to kill him, but commited suicide by falling on his sword when the armor bearer refused (1 Sam. 31 5). In an alternative version of the story, a young Amalekite presented Saul's crown to David—here the Amalekites had not been wiped out—and claimed to have finished off Saul at his request (2 Sam. 1). The bodies of Saul and his sons were publicly displayed by the Philistines on the wall of Beth-shan, while Saul’s armor was hung up in the temple of the goddess Ashtaroth/Astarte. However, loyal inhabitants of Jabesh Gilead, remembering Saul as their savior, rescued the bodies, where they were honorably burned and later buried (1 Sam. 21:21-13). Your glory, O Israel, lies slain on your heights. Nor fields that yield offerings of grain . the shield of Saul—-no longer rubbed with oil. the sword of Saul did not return unsatisfied (2 Sam. 1:20-22). Sources are rather confused regarding Saul's descendants. According to 1 Samuel, Saul had three sons, Jonathan, Ishvi and Malki-Shua, and two daughters, Merab and Michal. Saul's primary wife is named as Ahinoam, daughter of Ahimaaz. 1 Chronicales 8:33 says that Saul's sons were named Jonathan, Malki-Shua, Abinadab, and Esh-Baal (Man of Baal). 2 Samuel calls the latter son Ish-bosheth (Man of Shame). In addition, 2 Samuel 21:8 refers to "Armoni and Mephibosheth” as "the two sons of Aiah's daughter Rizpah, whom she had borne to Saul." Earlier references to Mephibosheth in 2 Samuel, however, speak of him as Jonathan's son, not Saul's. In any case, Ish-bosheth/Esh-Baal apparently reigned as king of Israel from Saul's stronghold of Gibeah after Saul's death. David, meanwhile, reigned in Hebron as the king of a single tribe of Judah. 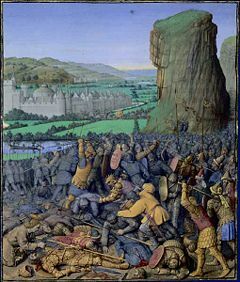 There followed a long and bitter civil war between Judah (supporting David) and the northern tribes (supporting Ish-bosheth). Eventually, Abner, Saul's cousin and former army commander and advisor, broke with Ish-bosheth and went over to David's side, bringing with him key elements of the northern alliance, including David's first wife Michal. The war finally ended when Ish-bosheth was assassinated by two of his own men. With Ish-bosheth out of the picture, the leaders of the northern tribes came to David and declared him king by popular assent (2 Sam. 5). David held Saul's one remaining grandson, Mephibosheth, under gentle house arrest in Jerusalem. Several northern factions formerly loyal to Saul held out against David and mounted rebellions against his rule. An objective assessment of Saul's contribution to the history of Israel necessitates an attempt to liberate the "historical Saul" from the pro-Davidic narrative that constitutes our only source for his reign. One has only to recognize that the writers allow Saul's adversary, David, to deliver his eulogy to understand this. In what sense is it even accurate to think of Saul as a "king" other than the fact that he was reportedly anointed as such? He was reportedly able to muster and lead a very effective army, but other than the degree of his military success what did he do as a king? Did he truly unite the Israelite tribes into a national federation with a centralized administration? The answers to such questions are not easy, since so little of such information is given in the narrative, and some of the sources seem to come from a later period in which the monarchic institutions were well established and editors may have projected the realities of their own day back into the history of Israel under Saul. Archaeological findings, such as those discussed by Israel Finkelstein in The Bible Unearthed, lead many scholars to conclude that the population of Israel in the time of Saul was still very small and incapable of supporting an administrative apparatus resembling that of the other monarchic societies that surrounded, and sometimes infringed on, the Israelite tribal lands. Indeed, little in the narrative itself speaks of Saul as a governing monarch as opposed to a military leader. Rather than seeing him as failed king, we may do more justice to his memory to think of him as an effective fighter for Israel's independence who helped lay the foundation for a monarchy that was yet to emerge. Regarding the text itself, according to critical scholars, the story of Saul's life is essentially a splicing together of two or more originally distinct sources. A monarchial source begins with the divinely appointed birth of Samuel, though many scholars think it originally referred to Saul. It then describes Saul's battle against the Ammonites, his designation as king by the people, and his brave attempt to lead them against the Philistines. A republican source includes such themes as Samuel's opposition to the institution of the monarchy, Saul's usurpation of the priestly office, Saul's failure to follow God's instructions in the holy war against the Amalekites, David's choice to spare Saul's life as "the Lord's anointed," and Saul's decision to consult the "witch" of Endor. Scholars also speculate that a sanctuaries source may exist, related to the history of various holy places such as Gilgal, Carmel, Bethel, etc. Finally, the hand of a "redactor" is seen, a later editor who has inserted various summaries and judgments in accordance with the viewpoint of his particular period. ↑ Jewish Encyclopedia.com. Saul. Retrieved July 16, 2007. This article incorporates text from the 1901-1906 Jewish Encyclopedia, a publication now in the public domain. Budde, K. Die Bücher Richter und Samuel. 1890. pp. 167-276. Cheyne, T. K. Aids to the Devout Study of Criticism. 1892. pp. 1-126. Driver, S. R. Notes on the Hebrew Text of the Books of Samuel. 1890. Smith, H. P. Old Testament History. 1903. ch. vii. This page was last modified on 20 August 2015, at 19:34.